Spray Polyurethane Foam (SPF) for roofing applications has been used to provide unsurpassed protection for low sloped and flat roof buildings since the 1970s. Over the years, it has proven to outperform any other roofing system. At Armstrong Roofing, we immediately recognized the benefits of installing SPF roofing systems for our residential and commercial customers in the San Francisco Bay area. Consequently, for almost four decades, we have installed, and backed up with the best, longest-lasting warranties available, more residential foam roofing than any other company in America! Polyurethane was developed in 1937 in Germany by Otto Bayer. A little less than 20 years later, in 1953, Walter Baughman created the “Blendometer” which was able to mix the necessary chemical and create what we know today as the expanding foam. At that point, polyurethane could be applied as a liquid which expanded into a thick foam that quickly hardened upon curing. However, it wasn’t until 1963, when Fred Gusmer invented the first dedicated spray technology machine, allowing the application of spray polyurethane foam, when this material was able to be used for roofing and insulation. SPF roofing systems came into existence in the 1970s during the energy crisis when people began to realize that there was a need for more economical and energy efficient products. By the 1980s, we had documented evidence by Texas A&M University of the effectiveness of SPF roofing systems. Coupled with new improved equipment and products which made the application of SPF easier and more efficient, Armstrong Roofing began installing SPF roofing systems on flat and low sloped roof residential and commercial buildings in the San Francisco Bay area. Today, roofs coated with SPF over 40 years ago are still performing well with only minimal maintenance. Once an SPF roofing system is installed, it will only need periodic recoating for decades of service! This quality is extremely important since it eliminates the issues resulting from expansion and contraction which permit water and microbes to seep in and damage your roof. It eliminates roof leaks caused by faulty flashing because SPF conforms to any substrate when installed. This makes it ideal for flashing parapet walls, equipment, skylights, and cooling towers. Studies conducted by Dr. R. Dupuis, indicate that SPF roofing provides superior hail and impact absorption. What is more, if a wind-driven missile damages the roof, it will rarely cause a leak and the damage can be easily repaired without compromising performance. SPF roofing also provides high wind uplift resistance, proven by field observations of SPF performance during Hurricanes Allen, Hugo, and Andrew. Laboratory testing by Underwriters Laboratories and Factory Mutual has also shown that SPF’s wind uplift resistance exceeded the capacity of their testing equipment. Another important feature of SPF roofing systems is the fact that they have no fasteners which can come loose or damaged, thus compromising the performance of your roofing system. The energy efficiency of polyurethane is undeniable. This material is used to insulate a myriad of things from hot water heaters to coolers and fridges (and of course roofs). Research by Texa A&M University has shown that the energy savings from SPF roofing can pay for its cost within 3 to 4 years. The R-value (insulation capabilities) are very high when compared with other forms of insulation. Also, the fact that it has no fastener increase energy efficiency since fasteners have been reported to reduce the insulation value from 1.5% to 31.5%. The reflective nature of the light-colored coating applied over the foam also reduces the effects of the sun on your roofing system (keeping it 50 to 80 degrees cooler) which significantly decreases utility costs during the summer months. According to Oak Ridges National Laboratories (ORNL), a sustainable or green roofing system has “a long life, low maintenance, saves energy, adds durability to buildings, controls moisture in buildings, and contributes very little to the waste stream.” SPF roofing systems comply with every criteria referred to by ORNL. With proper installation and maintenance, your SPF roofing system can protect your home for a lifetime. You only have to recoat it every 20 years to ensure it keeps performing like new. Furthermore, the components of the SPF mixture are classified as having zero ozone depleting potential (ODP), ultra-low global warming potential (GWP), producing low emission of VOCs and being free from chlorofluorocarbons (CFCs). In addition, SPF roofing eliminates the need for costly roof tear-offs and waste which will end up in landfills. This is possible since the foam can adhere easily to most material and in most cases, the installation of SPF requires minimal stripping of the original roof (saving you time and money as well). SPF roofing systems weigh approximately 60 lbs per 100 square feet versus 600 lbs per 100 square feet for a typical built-up roofing system. 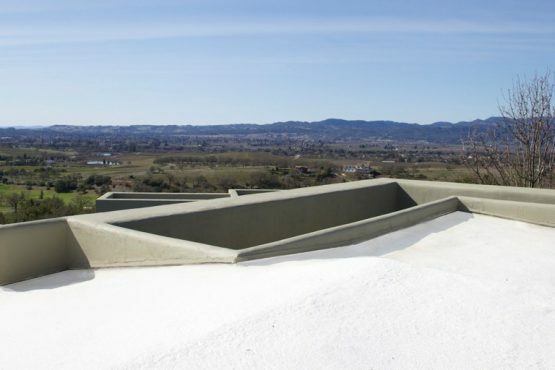 Consequently, due to its lightweight nature, SPF can be applied directly to many existing roofing systems without adding significant stress to the walls and beams of a building. For more information about SPF roofing systems or a Free Estimate, please contact Armstrong Roofing today. Our extensive experience in SPF roofing coupled with the best, longest-lasting warranties available means that you won’t go wrong with Armstrong. Before considering any other roofing system for your flat or low-sloped roof, let Armstrong show you why our Bay Area SPF roofing system is the best investment for your home or business! For more information about the benefits of SPF roofing systems, please read some of our previous articles: 1, 2, 3, 4, 5, 6, 7, 8, 9, 10.